French President Emmanuel Macron and his centrist allies may have secured a majority in France’s lower house of parliament, but with a record number of voters choosing to abstain, Macron may have scored a partial absolute victory after Sunday’s second round of legislative voting. Macron’s year-old La République En Marche! (LREM), buttressed by the centrist Democratic Movement (MoDem), secured a 350-seat absolute majority, but achieved smaller gains than were originally projected by pollsters. 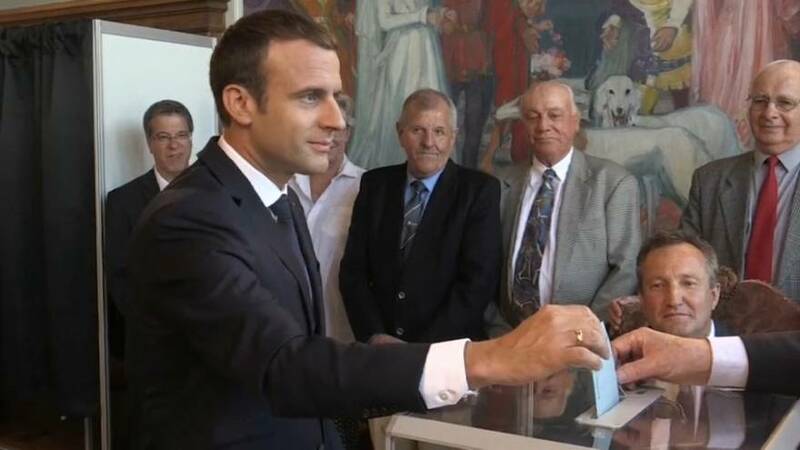 The LREM won 308 seats and MoDem’s 42 carried the President’s nascent political movement into an unassailable position within the government, but those gains are a far cry from the nearly 400 seats Macron was projected to win last week. Sunday’s vote is particularly punctuated by a record-breaking number of abstentions in which 57.4 percent of voters chose to avoid voting centres. That number is higher than the 50.3 percent who abstained in the first round. The number of abstentions for both the first and second round of voting were the highest since the founding of France’s Fifth Republic in 1958. Government spokesman Christophe Castaner said the high abstention rate was a failure of the political class and underscores the need for Macron to change politics in France. “The real victory wasn’t last night, it will be in five years’ time when we have really changed things, he said to RTL Radio. The 2017 result is the first time less than half of registered voters participated in legislative elections and it could set the tone for the extent of Macron’s mandate after this first litmus test. Sunday’s result also constitutes the largest drop in voter participation from first round voting to second round voting. Participation dropped by more than six percent eclipsing the previous record of 4.1 percent achieved in 2002. The vote suggests that while President Macron has the support of the French public, he does not have their unquestioning loyalty. It may force Macron to tread carefully when acting on his campaign promises. Macron vowed sweeping reforms to reduce the number of public servants by 120,000 and achieve budget savings of €60 billion during his five-year tenure. He has also promised to reform the country’s state pension regimes and labour market. While Economy Minister under former President Hollande, Macron faced stubborn national protests against his 2015 “Macron Law” designed to liberalise the French economy and boost growth. Macron may struggle to win over the country’s powerful trade unions. The CGT, one of France’s most active and militant, called for a demonstration in Paris against “liberal” economic policies the day after Macron was elected president. Sunday’s result also signaled the near obliteration of France’s traditional two parties, the Socialists and The Republicans (LR). The conservative Republicans and their centre-right allies won 136 seats while the Socialists and their centre-left allies held on to 46 seats. During France’s last legislative election in 2012 the Socialists were the country’s largest party with 280 seats. The then UMP, the predecessor of the LR, won 194 seats. Jean-Christophe Cambadélis, the first secretary of the Socialist Party resigned from his post Sunday as his party suffered one of its worst defeats in recent memory. The Republicans and their centre-right allies represent France’s largest opposition bloc representing a total of 147 seats. The vote result was a near catastrophe for the far-right National Front whose leader, Marine Le Pen, anticipated her party would become the voice of France’s political opposition after the 2017 presidential election. The National Front took eight seats in Sunday’s second round of voting. The far-left, led by Jean-Luc Mélenchon, won 17 seats. A record number of women were also elected into government Sunday. Of the 577 members of France’s lower house, 233 of them are women. France now ranks 17th in the world for its number of women in government and ranks 6th in Europe above Germany and the United Kingdom. Women now represent nearly 40 percent of France’s National Assembly up from 12.3 percent in 2002. Of the number of LREM representatives elected, 47 percent of them are women.